The earliest Battishill who can reasonably be identified as a direct ancestor is Richard Battishill of South Tawton, who married Elizabeth Reeve in 1688. His baptism has not been found in South Tawton nor in the nearby parishes. West Wyke, or West Weeke, lies on the far side of Ramsley Hill from South Zeal, which is now a larger village than South Tawton itself, though part of that parish. The present house was built in 1656. The Battishill coat of arms can be seen in Chagford parish church, on a medieval stained glass window near the organ, in what was once St Katherine’s chapel. 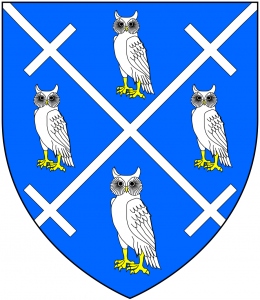 They are “Azure, a saltire crossed at the ends argent between four fowles [owls] argent, bills or.” In other words: A blue ground, bearing two silver staves, with a small cross at each end, arranged in an X, with a silver owl in each of the four spaces. One of the roof bosses in the church of St Andrew, South Tawton, is an owl. The name had a long and distinguished history elsewhere in Devon. Martin Battishill was High Bailiff of Exeter in 1366 and 1367, and Mayor in 1376. Henry Battishill was Sheriff of Exeter in 1621, 1639 and 1640. Peter Battishill was Sheriff in 1679 and William Battishill in 1702. The Battishills also occur early in the South Tawton churchwardens’ accounts. In the 1520s we have Richard Battishill, ‘custodian of the hoggenre store’, Robert Battishill and Thomas Battishill of Iuffeton, who is a landholder. By “STORE” (“INSTAURUM”) must be understood a Stock of money & goods dedicated to the honour of some Saint, and raised by or entrusted to some one of the divers lay-brotherhoods or –gilds (economic-religious societies) of men or women or both that were prominent feature of parochial life in Mediaeval times. Often these maintained a Chantry Clerk or an altar, or at least a light to burn before an image in the church, and a part at least of their profits was always devoted to ecclesiastical or parochial uses. CHURCH ALES. An established institution for the benefit of such Funds was the so-called “CHURCH ALES”, a public festive gathering at which ale brewed in the Church House and cakes baked in its oven were disposed of either in that building or in the Church yard. At South Tawton, Wardens of the gild of “YOUNG MEN” – identical, it would seem, with the “HOGNERS” and with the devotees of “ST GEORGE”, appear to have undertaken the responsibility of the ALES, though the last named were, I suspect, in this and other parishes, primarily a military or archery-practice organisation. The Church House in South Tawton is a fine stone building with a double exterior staircase. 1530s – Richard again appears as custodian. Christopher is paid for ironwork on the bells. 1550s – Money is received from Hugh. Wyllyam is paid for fetching home the church harness, and again for his expenses to appear before the commissioners. ‘Mayster’ (Master) Battyshill and his company are paid for riding to Exeter. Hugh Battishill was churchwarden in 1553. 1560s – Received from Hugh Battyshyll ‘for a shape given of Richard Batthyll unto the church’. It is clear from this that some Battishills were gentry, that they undertook responsibilities for the church, as churchwardens or feoffees, while others were craftsmen. Other Battishills served as churchwarden: Hugh in 1578, Andrew in 1582, John in 1602, Thomas in 1610. The baptismal registers for the early 17th century show as parents: John Battishill, gentleman, and Jocosa, Thomas and Johanna, John and Izoat, John and Eglena, John of Westweeke, yeoman. As we move into the 1640s we have John and Johan, and Andrew. 1644 A caveat not to grant a licence of marriage to Andrew Battishill of Drewsteignton, who is a minor, and a ward of the King, and any woman, especially [blank] Oxenham of Southtawton, without first calling Joanne Battishill, his mother, or Mr Linscote, the proctor. May 6. The Oxenhams were one of the leading families of South Tawton. Today, the inn at South Zeal in this parish is the Oxenham Arms. In Westward Ho!, Charles Kingsley immortalised the flamboyant Captain John Oxenham of South Tawton, with whom young Amyas Leigh sails in the time of Elizabeth I.
Joanne Battishill could not have objected to a marriage with the Oxenhams because of their social status. From this Marriage Licence caveat it apppears that the Battishills of Drewsteignton were Royalists. It may be that the Oxenhams were Parliamentarians. We do not know which side the South Tawton Battishills favoured, or indeed if they all took the same side. Eight months after this caveat, young Andrew Battishill bowed to his mother’s wishes and married instead Joanna Stuckey of Moretonhampstead. Their son Thomas Battishill and his wife Aphrah have memorial tablets in South Tawton church. The 1642 Protestation Returns show only three Battershill men in South Tawton: John, Roger, and William, who signed the return as churchwarden. There were none in Drewsteignton or Throwleigh, where Battishills are found at other times this century. It would thus appear that there was only one Battishill family in Drewsteignton, and Andrew was not old enough to take the oath. The 1650s bring us closer to the estimated date of our Richard’s birth. His parents, if he was from a South Tawton family, could be Andrew, Roger (gentleman), or Richard. The burial records show that Andrew was a gentleman, whose wife was Joane, and that Richard’s wife, who died in 1669, was Maude. There are two baptisms in the mid-17th century for children of Richard Battishill. Joane was baptised on 1 March 1656/7 and Thomas on 24 July 1659. This Richard could be the father of the younger Richard, who married Elizabeth Reeve in 1688. Richard junior might have been baptised outside South Tawton. On 15 Sep 1673, Richard Battishill married the widow Jane Dinning. Since there is a burial for Maude, wife of Richard Battishill, in 1669, this is probably the same man. The churchwardens’ accounts for 1674, 1677 and 1678 show poor rates charged to Richard Batteshill at 3d. These accounts begin in 1648 and there is no other mention of Richard. He may have lived for a time in another parish, or been ineligible to pay the rate for some other reason. 3d is a very modest amount, but not the lowest. Unfortunately, the 1674 Hearth Tax Returns for South Tawton are lost. These would have shown us how many Battishill households there were, and the size of their homes. It is clear that there were branches of the Battishill family of lower status than gentry. It was probably from one of these that Richard, husband of Elizabeth, came. His son married the daughter of a well-to-do yeoman farmer, and it is likely that Richard came from similar stock. The groom and bride of that marriage were 17 and 13, unusually young. This suggests their families were affluent enough to support the young couple in the early years of their marriage. Frederic Thomas Colby, ed., The Visitation of the County of Devon: In the Year 1564, with additions from the Earlier Visitation of 1531. Pollard 1881. Roy & Ursula Radford, South Tawton & South Zeal with Sticklepath: 100 Years Beneath the Beacon, Halsgrove, 2000, p.85. Charles K. Burton, The Parish Church of St Andrew, South Tawton, Devon, and Chapel of St Mary, South Zeal. British Publishing Co. Ltd., Gloucester, 1961.Burton.